My attitude when touring a brewery has changed significantly over the years. Beer is made the same everywhere, but the process of explaining it to the visitors is seldom the same. I’ve had phenomenal tours, I’ve had lousy ones. 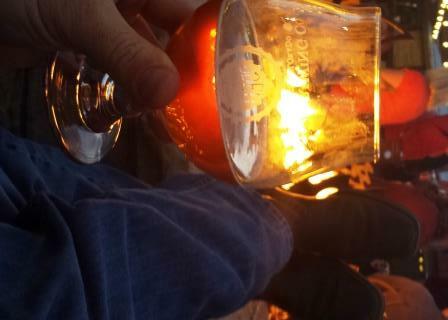 In an ongoing effort to point out the best of the best, here are my top ten brewery experiences as of September, 2014. Keep in mind, that my former job as the executive director of Madison County Tourism, and the president of the Central NY vacation region granted me access that I can’t always get anymore, but then again this is all about what I experienced while there. 1. F.X. Matt Brewing, Utica, NY — Hands down the best all around tour I’ve been on. From surviving prohibition to their transformation from crappy yellow beer to one of the premier craft brewers in the Northeast, this tour covers it all. On top of it all it ends with free pints in their beautiful tavern. One of the few I’ve gone back and done more than once. 2. Harpoon Brewing, Boston, MA — When people think beer and Boston, most often Samuel Adams is the first beer to pop into mind, but Harpoon has Massachusetts Brewing License #1, and their tour is well worth the time. From the free samples, to great pub overlooking the harbor, Harpoon gets it right. 3. Odell Brewing Company, Fort Collins, CO — Five words. Great beer on the patio. Odell right now occupies the “go to” brewer for consistently great craft beer in my region. Their outdoor patio is the place to be in the afternoon and evening, enjoying a pint of their hand crafted goodness. The tour is ok, I’ve done it once, but the atmosphere, food trucks and Adirondack chairs on the patio make this the place to hang out. 4. Anheuser Busch, Fort Collins, CO — Yes, the King of Beers offers the King of Tours. The Clydesdales are based in Ft. Collins, and no matter what you think of the product, the horses are as American as it gets, right there with beer and apple pie. The tour is outstanding especially when you think about how much beer is actually produced there each and every day. It will blow your mind. Free tastings in the tasting room, and you can enjoy it as long as you want as long as you don’t make a fool of yourself. 5. Harvest Moon Cidery, Cazenovia, NY — Here is a case where access and friendship leave a soft spot, but that shouldn’t deter you from trying to experience it yourself. I watched Matt and Juanita build the cidery from the ground up and Matt is always willing to share that story and his growing knowledge of craft ciders with anyone who will walk in the door. 6. Empire Brewing Company, Syracuse, NY — Farm to table before farm to table was cool in upstate NY. Crafting great beers for a lot of years now, when they reopened in Armory Square they dominated the buy local movement. Whenever we are back in Upstate we try to stop in there to enjoy a few pints and their fantastic food. Excited that their new brewing facility will be open in the next 18 months and they will get wider distribution. 7. Big Beaver Brewing, Loveland, CO— Shaved Tail Ale. Need I say more. Big Beaver makes the list, because I’m a 13 year old at heart and their off color, but great tasting beers make this a fun experience for anyone who won’t take their beer or their surroundings too seriously. I mean if you are going to put a Big Woody in your mouth, (an IPA) you can’t be afraid to laugh. 8. Good Nature Brewing, Hamilton, NY — Another brewery that I had a chance to watch being born. Located in the heart of America’s hisorical hop birthplace, Good Nature is great place to grab a beer and get to know those who hand craft it all. It is not unusual to see Matt or Carrie behind the taproom bar and it is always a joy to see what new beers are on tap. 9. Freedom’s Edge, Cheyenne, WY (Tivoli Location) — Our new hometown haunt, but they make this list for their previous location in the Tivoli Building in downtown Cheyenne. A former saloon and brothel made for the perfect setting for a Wyoming Brewery. Their new location is fun too, but it could be anywhere. The Tivoli and its beer garden were special. 10. Rouge Ales, Portland, OR — Rouge Ales, Dead Guy and others. Some of Portland’s most popular beers. I visited for dinner on a business trip there in the spring of 2015 and was very impressed by the commitment to local ingredients and the atmosphere of the tap house. Of course the excellent selection of hoppy ales didn’t hurt either. This list is constantly changing, and I’d love to hear what your favorite brewery experiences have been.